Instagram For Video—Massive Market Opportunity, Yes! Done Right, No! Editor’s Note: The following is a guest post by Peter Csathy, President & CEO of online video technology company Sorenson Media. Csathy previously served as CEO of video chat company SightSpeed (acquired by Logitech) and as President & COO of online music pioneer Musicmatch (acquired by Yahoo!). Oh, to become the Instagram for video! THAT is the dream of scores of new tech start-ups. And, that is the Holy Grail for all the VCs who continue to plow money into those companies. After all, Facebook just dropped a cool $1 billion on Instagram (well, actually closer to $700 million) – and each of us can now easily capture pristine HD video on our smart phones that we carry at all times. That means personal HD video capture anytime, anywhere, and without any pre-planning. The sheer volume of personal UGC video has exploded. The potential market opportunity is massive. And, it is ripe. If it only were that easy. But, of course, it isn’t. Instagram’s own CEO, Kevin Systrom, recently emphasized that video is “hard” (downright “gnarly” in the words of Bruce Dunlevie of Benchmark Capital). Video is worlds away from the Instagram world of still images. Not only are the experiences and use cases vastly different, the technology necessary to achieve a compelling user experience is vastly different. And, no company has come close to locking down the full recipe for success on a massive scale. Read along, and I will lay out those ingredients. That’s why video Instagram wannabees focused primarily on public sharing (YouTube, Facebook, Twitter) are ignoring the massive market (aka “monetization”) opportunity that lies in “personal video” – that is, video of family and friends that is more likely to be shared privately. You (likely) don’t want your baby’s first steps on YouTube — you want them locked down. A fundamental practical consideration also separates video from stills – that is, videos dwarf still images in the sheer amount of data involved. This fundamental fact radically impacts business models that work. Pure-play VC-backed start-ups– going it alone – will have a very tough time finding any way to cover their costs (primarily storage). Most of them haven’t even tried, instead focusing on building their user base a la pre-Google YouTube. But, lest we forget, YouTube found its savior in Google to cover its OPEX. Remember YouTube also-ran Veoh? They too had massive users, but no saviors. Now they have no business. There will be lots of Veohs in this space. Does this mean that Video Instagram is DOA? Not at all, but the monetization path is more likely to be attenuated and available to mega-companies (relying upon the technology of the small guys). More on that later. The first ingredient is easy – the iPhone “flipped” the market with one-click video capture (now 1080p) and virtually all smart phones now make the grade. But, things fall apart fast from here. they say, easy is hard. Very few will get it right. Things really break apart at ingredient 3 – untethered fast file upload — a prerequisite for sharing. I am not talking about docking your smart phone at home and uploading the old-fashioned way. Way too many steps there to be compelling for the “instant gratification” use cases of sharing then and there. Ahh, but you say that Apple already has solved Ingredients 1, 2 and 3 with its iPhone/iPhoto/Apple TV combo pack. Not so. iPhoto (true to its name) isn’t designed for video specifically. Further, Apple TV (via AirPlay) does not enable sharing. And, have you ever tried to instantly share your iPhone-captured videos via text messaging? They look terrible. That HD video is nowhere to be found. MMS still only supports 3GPP video (which means 176 x 144 and 10 frames per second). Sure, you can try to email that video wherever you are (at your kid’s soccer game?). But, good luck uploading that hefty file on your network. Its sheer size will choke your network and prevent anything but a small snippet to be uploaded in any reasonable period of time. What is needed – and what Apple doesn’t have – is fast file upload technology which enables uploads at up to 100X or more faster than normal speeds (my company, Sorenson Media, partners with Aspera to solve this problem as part of our own Store & Share solution). Local device compression also helps. And, it’s a bonus if the service auto-detects the user’s connection and harnesses the power of wireless networks whenever possible. How about the fourth ingredient of cloud transcoding? Sounds pedestrian, but transcoding plays an increasingly fundamental role in our multi-screen world and is essential to effective sharing. Yet, very few have the technology to get multi-screen “right.” That is why online video platform granddaddy Brightcove just used over half of its cash ($30 million of it) to acquire 10-person cloud transcoding start-up Zencoder. 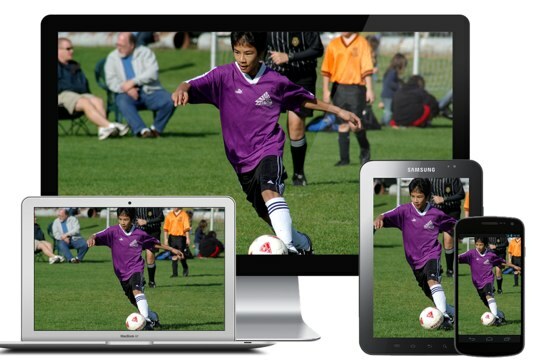 Transcoding transforms the single video file into multiple renditions to enable optimized viewing on any device. Transcoding done right also is essential to enable delivery and playback of a true HD experience. And, no matter what anyone may say, quality absolutely matters. In fact, the importance of HD quality is “growing” according to a recent study by global telecom giant Ericsson. These are your most cherished life memories. You will want to watch these from your couch on your beautiful big screen TV. Speaking of watching from your couch, consumers must be able to easily and intuitively access and manage their personal videos on both their device and on any connected device. This is ingredient #5 — the CMS piece (content management system). Think U/X here. The winning service provider must sweat the details and have consumer DNA in their blood. Think Apple again. Finally, ingredient #6 – intelligent, secure delivery and playback – all done invisibly. The shared video must simply “work” – the service must intelligently deliver the “right” optimized rendition no matter what device is on the receiving end. And, don’t forget, the privately-shared video must be locked down. Security is essential. service, and OVP Vmix’s Givit. But, none of these services integrate seamlessly with capture devices (i.e., Apple’s playbook for success), and few yet seem to have any real consumer traction (several would not reveal user numbers). Amongst the Goliaths, Apple and Google come closest right now — Apple (but with the limitations discussed above), and Google (via YouTube’s locked-down sharing functionality — but YouTube effectively owns your videos! Check out its EULA). Shutterfly is strong contender given its huge customer base (my company, Sorenson Media, powers its private video Store & Share service). And, don’t forget Dropbox, Box, and Facebook’s Instagram of course. But Instagram’s DNA is public sharing, and none of these three services are yet optimized for video (although Dropbox just announced a new partnership with online video service Vimeo). That means that no one has yet baked the full recipe for success. The massive opportunity is wide open. Carriers and consumer electronics companies take note. Run, don’t walk, to offer up this kind of service right now. Find a partner. Marry your hardware and Store & Share to capture this market opportunity for yourself. Own the customer experience. Don’t give it to Google or Apple (like you did with the VOIP and video chat market opportunity). Monetize it. Personal video can be marketed with heart-strings – nothing moves units like the emotion of life’s most precious moments (remember that FaceTime commercial with the dad video chatting with his wife and newborn? Tears flowed as thousands marched to their neighborhood Apple store to get that new iPhone!). And, that’s the business model. Carriers – you can sell more pricey 4G plans. CE companies — you can sell more smart phones and TVs. Build in the Store & Share storage costs into your broader business models (think of those as marketing costs). Yes, the Store & Share service itself can be monetized, but the big prize is to use the service as the Trojan Horse to sell more of your core services and hardware. And, here’s the beautiful part. Once your customers begin to upload their personal videos and use your service as their personal video archive, then the real business magic begins – consumer lock-in! Now the consumer is yours potentially for life, because switching costs are simply too high. Look at me. I have been (happily) a 10+ year customer of Shutterfly – and will never leave – because I now have tens of thousands of still photos (and now videos) on Shutterfly. I will listen to anything they say! Monetize me! That’s gold, Jerry. Gold! Carriers and CE companies – choose your dance partners to do Store & Share right. Some of them may be on this list. All of your customers need Store & Share (even if they don’t yet know it). They will use it – more and more. THAT is the massive market opportunity.